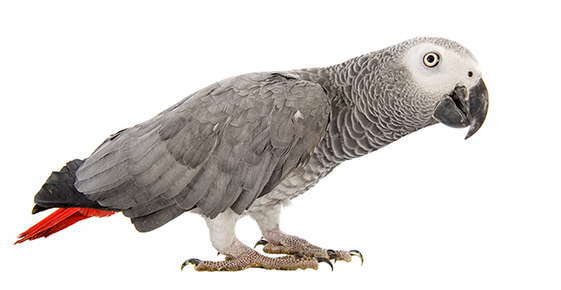 There are two subspecies of African grey parrot commonly found in the pet trade - the Congo African grey (Psittacus erithacus erithacus) and the Timneh African grey (Psittacus erithacus timneh). The Congo African grey is slightly larger than the Timneh, and has bright red tail feathers. The Timneh's tail feathers are darker (maroon), and overall the Timneh usually has slightly darker coloration than the Congo, especially over the back (although not always the case). While the Congo's beak is grey, the Timneh's upper mandible is bone colored with a dark edge, while the lower mandible is grey. There is some debate over whether there are significant differences in temperament between Congos and Timnehs. Some say the Timnehs are slightly more laid back and less prone to feather picking and other neurotic behavior. Others say there is no difference. There is a lot of individual variation between birds of both subspecies and even if there is a slight overall difference in temperament, this generalization won't necessarily hold true for any given bird. For the rest of this article, the term African grey will be used to refer to both subspecies, as they are very similar in character, and their care is identical. African greys have the potential to be very long lived, so be prepared for a commitment of 50 years or more. Average life spans are difficult to estimate for some parrots as the life expectancy varies widely and depends a lot on the history of the bird, stress, disease, and other factors. The range 25-50 years is often quoted for African greys. African greys are extremely intelligent birds. The most famous African Grey is Alex, a bird studied for years by Dr. Irene Pepper berg. Alex has been shown to have the ability to process information and make appropriate choices with the correct choice of words, and understand concepts such as color or shape (i.e. he is not simply displaying previously trained behaviors). Greys are excellent mimics, and many (though not all) are excellent talkers, with a capacity of over 2000 words. Even those that don't repeat words are very adept at repeating household noises such as the telephone or doorbell, often well enough to confuse their owners! Most greys have a large collection of sounds they repeat. As the studies with Alex have shown, greys have a unique capacity for putting their words and sounds into the right context as opposed to simply repeating them, showing their intelligence. Their intelligence makes the African grey a very demanding pet, however. You must absolutely be prepared to spend lots of time with an African grey, providing social contact as well as mental stimulation. Greys have been described as being the emotional equivalent of a two year old human, with the intelligence of a five year old. This means they need a lot of attention and patience, along with a good deal of guidance to acceptable behavior. And, they can be a challenge to deal with at times! African greys tend to be quite cautious with new situations and new people, although devoted to their owners. They have a reputation as one-person birds, but that is largely because often only one person in a household spends enough time with a grey to really form a close bond. Make an effort to socialize a grey with lots of people, although you will have to give your parrot the chance to become comfortable with any new person. A grey will happily interact with more than one person as long as the effort is made by each person to spend enough time to earn the trust and companionship of the bird. Greys have somewhat of a reputation for biting, but this largely relates to the socialization issue. Like other parrots they will bite, especially if they feel threatened in any way. However, the trust of an African grey must be earned through patience and respect, and pushing interaction with a grey that doesn't trust you fully may result in a bite. They are also perceptive to the moods of the people around them, so they should be approached with a calm and relaxed demeanor, or the bird may become agitated or excited. Also, a bored or stressed parrot is more likely to exhibit behavioral problems including biting, so making sure the emotional, mental, and physical needs of the bird are not being met will help avoid problems. The intelligence of these birds means they must have a lot of social interaction with their owners along with and mental and physical stimulation. African greys have a reputation as feather pickers. Parrots, including greys, will sometimes resort to feather picking or worse forms of self mutilation for a variety of physical and physiological reasons, and also if their emotional needs are not being met or they are stressed. It should be noted that any bird that is plucking its feathers needs a thorough check up with an avian veterinarian to rule out a physical cause first, and if none can be found that behavioral reasons should be explored. Any increased tendency greys might have toward this problem is likely due to their intelligence and needs for attention and stimulation. In summary, African greys are magnificent and amazing parrots, but are not the right bird for everyone. Potential owners need to carefully evaluate their ability to commit to the needs of these birds for their expected life span, and be sure they understand the best way to care for these wonderful parrots. Cage size: the bigger the better. You'll need a large cage for these guys. I would recommend a minimum in the area of 3 feet by 2 feet by 4 feet tall, but bigger is definitely better when it comes to housing parrots. The bar spacing should be 3/4 to 1 inch (best to get 3/4 inch spacing for a Timneh). At least part of the cage should have horizontally oriented bars to allow the parrot to climb on the sides of the cage. The cage should be placed in a part of the house where the bird will have lots of contact with people, but ideally not in the most hectic area of the home. Keep the cage away from windows where they would receive direct sunlight (may overheat), away from draughts, and not too close to heat vents or air conditioning ducts. A selection of perches should be provided - varied in size and material (e.g. natural branches such as manzanita wood, which is often available at pet stores). Smooth, slippery perches should not be used, neither should sandpaper covered perches. Provide a good selection of appropriate toys - the right size and checked for safety concerns (parts that could be swallowed, strangulation or entrapment hazards). Having a good selection of toys on hand and rotating them through the cage a few at a time can help to provide entertainment and stimulation. Should also invest in a good play gym, and plan on having your African grey spend a significant amount of time outside of his or her cage daily. Variety is the key here. Pelletted diets should form the foundation of the diet, but should be supplemented with a variety of fresh fruits and vegetables as well as grains and proteins. A small amount of seed mix can be fed as well, keeping in mind that seeds have some nutritional value and place in the diet but are largely fattening and poorly balanced as a main part of the diet. " African greys are somewhat prone to calcium deficiency, so calcium levels should be monitored at a yearly vet check. Calcium supplements should not be used except under the advice of a veterinarian, but it can be beneficial to feed a variety of calcium rich foods such as leafy green vegetables (kale, mustard greens, swiss chard, spinach). Fresh clean water should be available at all times. Food and water dishes should be washed daily.